SIFF women’s development officer, Diane Justus, thanked the participants for their interest but warned them that the process of becoming fully qualified referees is only beginning. “We are thankful for your decision to attend this refereeing course, I am sure you will worthy assets of football development in your communities in the future. This is but the first step for you and eventually you will be fully qualified referees through further training and practice which will delivered to you via our referee development office,” says Ms. Justus. Hamilton Siau, Reggie Iemae and John Saohu. The course covers the football Laws of the Game and how they are applied in game situations. It introduces candidates to the role of the referee and assistant referees. One of the participants, Moses Haumau, thanked SIFF for giving them the opportunity to join refereeing and challenged his fellow participants to go out and make their contribution to football. “We have been accorded with a wonderful opportunity and I want to thank SIFF on behalf of all the participants for this. I also want to urge my colleagues here to support SIFF with football development because the responsibility belongs to all of us as people who are passionate about this sport,” Haumau said. The referee course is especially held to prepare expand the local referee pool to cater for new competitions to be launched by SIFF next month including the national women’s football league and a youth competition. The education process for the participants will continue in the form of training and practical sessions to be conducted at the SIFF academy. 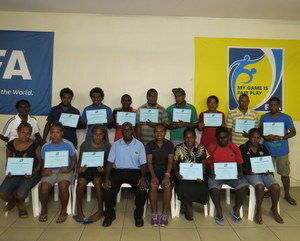 All participants were issued with a SIFF Basic Refereeing Certificate for their attendance of the course.